I have created a new amazing energy healing method for natural healing, I call The 'Heal Yourself' Pain Relief Method, that you can use yourself on your own pains for natural pain relief and on a wide variety of other conditions just by simply pointing to the problem area. I created it first and foremost for pain because this is something that plagues so many people. In fact, of all of my services natural healing of physical pain is one of the top requests I get. This item is No Longer Available. I've replaced it with Melanie's Miracle Water. It's still a good article though if you wish to learn more about what I do. It works very quickly for all sorts of pain and most respiratory and sinus allergy symptoms. By continuing to use this alternative healing method you can most likely heal whatever it is that is causing the pain. You just have to continue to use it for as long as it takes to finally be totally pain or symptom free. I am still testing and finding out what it can do... and what it can't do and why. And when I figure this out I will experiment to figure out how to fix it. Up until now I usually had to do energy healing for physical pain relief myself for my clients. Actually I still do this.... I have to use my own time and energy by meditating on the person and his/her problem with a specific intention in mind. It isn't hard to do but I felt that I could create something that was even faster and even more powerful... something more automatic. I started off with The Paper Radionics Machine for Healing Pain. This was one of my first projects that still works okay but it is not as strong or as powerful as my new method. I could always make The Paper Radionics Machine even stronger... as strong as this new method but I think I will keep it as it is for now. If you're having pain the pain you feel is just a symptom. Something else is causing the pain. If you can't figure out what is causing the symptoms or you are not able to address the cause for whatever reason then it is best to focus on the symptoms directly. That is what this method does. The 'Heal Yourself' Pain Relief Method treats the pain and other symptoms and when you continue to use it long enough it also helps whatever is causing that pain or other symptoms. It is an energy healing method that helps to relieve pain naturally. Now let me explain how this new energy healing method works. It is so simple that anyone can use it quickly and easily. How? Simply by pointing to the area that is in pain the energy healing will begin on it's own until the pain subsides. I made it so that any person can use it whenever it is needed because some people have pains that come and go often and I can't be around all the time to help everyone. Therefore, it is always available to you when you need it. You can go about your day and any time you have a pain or other symptoms all you have to do is point to the area for a few seconds with a quick thought of relieving your pain or healing the area and it will be done. After that you can just relax or continue what you were doing until the pain subsides. Many times you will forget that you even had pain and you will go on to other things and later realize that you are now amazingly naturally pain free. This realization is kind of startling and exciting at first when you begin to use it and you find that it actually works as I said it would. After that you will just believe and expect it to work every time. This is what happens to everyone who has tried it so far. It is not actually a technique, method or process even though this is how I describe it. You cannot learn how to do this yourself. This is something I am able to give to you so that you can heal your own pains and symptoms. The Easiest Method to Treat Pain ... so that you do not have to learn how to become a "healer." It takes lots of time, maybe even years, and costs money to learn effective healing techniques to be able to learn how to do it yourself. Works Super Fast ... so that you don't have to wait around for results. Do It Yourself ... so that you don't have to rely on anyone else. Become Your Own Healer ... so that you can effect change to your body, mind and spirit yourself. This method heals on all levels. Rely Less on Pharmaceutical Drugs ... so that you can begin to repair the damage these drugs have done to your body and gradually release the addictive hold these drugs have over you. Taking pain killers can cause addiction so this method will help you to ease off of these drugs over time more easily than without it. No Having to do Meditation Yourself ... this saves you lots of time to do other things. Besides, it's hard to meditate when you're in pain. No Need to Ask Someone Else to do Healing or to Meditate for You ... because you will be your own healer. Works on Most Ailments ... you can try it on everything. No Techniques to Learn ... because this method is instantly available to you to use as often and as much as you like after purchase. It really is as easy as pointing a finger. The Longer You Use It The Better Your Results Will Be ... because you are allowing the healing energy to actually heal the area and not just treat the symptom. Simple! Just Point at the Area to be Healed ... And It Will Be Done! How long does it take to heal pains? Pain usually subsides within 1-3 minutes. Some pains may take a little longer to subside. How long does it take for the energy healing to relieve allergy symptoms? Respiratory symptoms and sinus allergic reactions and symptoms usually go away within 3-5 minutes and sometimes quicker. Sometimes it may take longer though. You may or may not feel anything while the healing is happening. If you do, it may feel like a warmth and/or a tingling sensation. It does not hurt at all. I created this method with the help of a thought-form energy ball. When you purchase below you will get access to your own thought-form that will do energy healing on any place on your body that you point to. Read this article for more information on thought-forms and energy balls and how I use them in my work. I've tested it on my mom, who I test all my experiments on. She experiences off and on pains depending on the way she lays or sits, etc. She was in a slip and fall accident a few years ago requiring surgery and she still has trouble daily with pains that pop up here and there. She also has pains in other areas which may not have anything to do with her fall but they cause her trouble daily. So I have had to do my usual healing method on her sometimes 3 times a day because of it. But I felt that this is not enough. I felt that there had to be something I could do so that she could basically have access to my healing abilities herself and do healing on herself at any time without asking me to do it for her. And my former paper radionics machine for healing just wasn't strong enough for the types of pain she was having. During my quest I created several new experiments and the outcomes were mediocre at best. But with perseverance and trial and error... because the experiments just were not working well enough... I finally came up with this new method that works absolutely wonderfully. And since inventing this new method, The 'Heal Yourself' Pain Relief Method, my mom does not ask me to do any energy healing sessions on her anymore. Whenever a pain resurfaces she points at it and the healing energy begins to send itself into the area healing the pain within 3 minutes or less. The kinds of pain my mom has are excruciating back and hip pains. This method is working great on those. She also has headaches daily. It's working perfectly on that. She also gets respiratory and sinus allergic reactions due to molds and strong smells like terrible smelling perfumes (mostly the air freshener scents). It's working amazingly on that. And for any other pains she just points to it and it is gone. As you can understand it is quite frustrating to have someone close to you constantly in a state of agony. It causes stress and a feeling of helplessness. Not being able to help someone you love is heart wrenching. And I feel like the longer a person uses this method the better the areas that cause the pain or symptoms will get. It will begin to help the affected areas heal itself and less and less treatments will be needed. This is why I continue to experiment with improving my methods for healing pains and other ailments ... not just to heal the pain or ailment but also to reduce the need for medication. Recently a user used the method on a fever blister (Herpes Virus). The user pointed to the fever blister in its early stages, while it was still very small, for a short while and it stopped growing. The user has never had this happen in all their years. She's never had a fever blister so small. Usually they grow into large blistery lumps which take between one and two weeks to completely heal. At the most it looked like a small pimple which is easily covered with a spot of makeup unlike usual, unchecked fever blisters. Pharmaceutical drugs are bad for you, they are killing people and damaging internal organs, cells and functioning of the body the longer they are taken. My main goal has been to finally get my mom off of pain medication for good because she has been having some issues with both over-the-counter drugs and prescribed drugs and my new method seems like the best option until I can figure out how to totally help the areas that are troubling her the most. As a side note, my usual energy healing method works great for pains but sometimes, for some people, there are reoccurring pains that are very hard to treat, meaning I can't always be there so the pains will go away when I do the healing session and then the pain will resurface again later. Again, these types of pains are one of the reasons why I have created this new technique. Pharmaceutical drugs are a crutch and should not be taken long term. They are good for short periods if this is the only way you have to get rid of pain. If you are taking pain medication for long periods of time because this is the only way you have to relieve the pain then by all means, do so. But... you should try alternative methods of relieving pain as soon as possible because if it works for you it is certainly worth it for the overall health of your body. You can then begin to restore your health with nutrition and other lifestyle changes with your focus on repairing any damage that has been done. Most people who complain about pain seem to just want the pain to go away, even for just a while, just to get some temporary relief. Even if the area is not totally healed they feel great for the moment and that is a blessing in and of itself. This is what pharmaceutical drugs do. They relieve the pain for a while until your next 'fix.' And just for that while when you're feeling total relief you are thanking the Gods for the current drug you're taking. You would do anything to get it, no matter the consequences. Being pain free is liberating. Anyone who has a pain and the pain goes away for a time feels better mentally, emotionally and of course physically. Just being pain free becomes an amazing experience. We take this state of being for granted when we are not dealing with pain in the moment. Going from being in pain to being pain free feels so good. Sometimes you only notice this satisfying feeling in the moment... that moment when you realize that you are no longer in pain... when the moment just before you were in pain. Any other time it doesn't feel as good and being pain free is again, taken for granted. How Would You Like To Be Naturally Pain Free? Think of the freedom being pain free will give you. You will feel better. You will have more energy. You will be able to spend more time with your family and friends. You will have more fun. You will be able to get out of the house and do everything that you want to do without restriction. Once you sign up you can have all of this and much more. When you purchase you will have access to this New Exciting 'Heal Yourself' Pain Relief Method and you will be able to point to any area of your body for fast relief of your pain and other symptoms. Purchase for Yourself Or Anyone You Want to Help... When you purchase the method for another person they will have the ability to use the method as outlined above. Then you can just tell them to point to any painful areas on their bodies for fast relief of pain. I believe that you will love and appreciate this service for the freedom it gives you as much as it does for my mom and my other clients. In fact, if it does not work for you and it does not help to control your pain or other symptoms as well as you would like I will give you a no questions asked refund within 30 days of purchasing. So take the full 30 days to try it out and if you find that The 'Heal Yourself' Pain Relief Method is not working as expected I will issue you a refund. There are two options: pay once and get one month's use of the service or pay monthly. The second option is for people who have reoccurring pains or symptoms often. If you choose to continue with the monthly payment you will have access to the service every month and you may use it as often as you need it. When you click the button above you will be transferred to https://consciousnessproject.net for payment. Contact me if you would like to purchase for 2 or more people. Purchase now to get access to this service in as little as 24-48 hours. Right now the price is very reasonable but I may raise it soon so secure your price by purchasing now at the current rate. If you only want one month of the service use the button above to purchase and then cancel your subscription before the next month's billing cycle. Cancellation is easy. Just click this link to unsubscribe. Once you've purchased I will send you a confirmation e-mail with your order details. Something I find that it cannot heal, which makes sense when you think about it and which can be said for most healing methods, is pains or conditions that come about due to a lack of certain nutrients. When the body does not have the right nutrition it is telling you by causing pain. The pain helps to get your attention so that you can do something about it. That being said, this energy healing method may still be able to relieve the pain or discomfort temporarily in these types of situations. If it does not then make sure to get a multi-vitamin and see if you notice any relief. You can do an internet search to see what vitamins or minerals you could take more of and see if it helps. Allergies - it works well with respiratory symptoms and sinus allergies but you should try to avoid the things and areas that cause allergic reactions if possible. Those areas will still cause issues and you may still need to use your current medication at times but this method will help to control allergy symptoms naturally so that you can taper off. 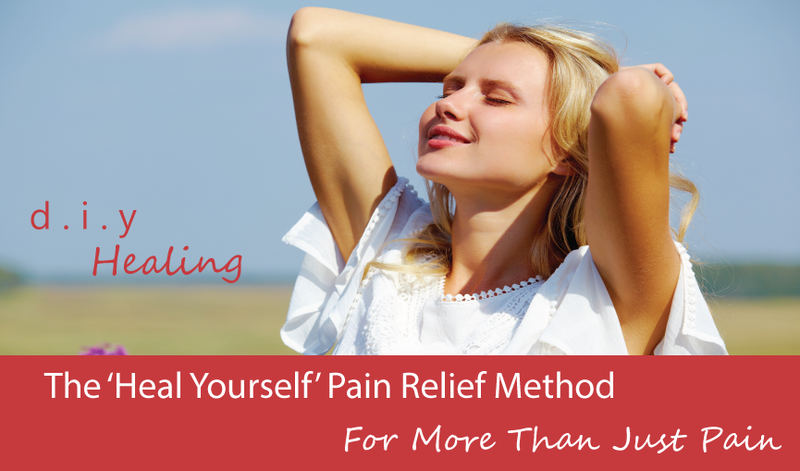 The 'Heal Yourself' Pain Relief Method is mostly for pains, but not necessarily discomfort. For example, if you ate too much your stomach will most likely still feel uncomfortable even after applying the method. A full stomach is not painful, just uncomfortable.